Did you know about the new challenge blog called Share Joy Challenge by Taylored Expressions? I always love challenge blogs because I love challenges. They make me think outside the box and push me to experiment new things. And they are fun to play along. The first challenge is now up and running. The challenges are weekly. Each challenge has two elements to it. For example the first challenge is a sketch and a colour challenge. You can use either the sketch or the colour or combine both to play along the challenge. So you have choices 🙂 That is cool. If you are bummed with the colours, then just use the sketch only, If you are stuck with the sketch, then use the colours to play. If you like both, then combine both on your challenge. The sketch will be one element of every challenge. Challenge will be posted every Thursday and closes on Wednesday next week. Here is the first challenge. I loved both the sketch and the colours. So on my card I combined both the elements. Here is my card for the challenge. I have adapted the sketch to a top fold card. 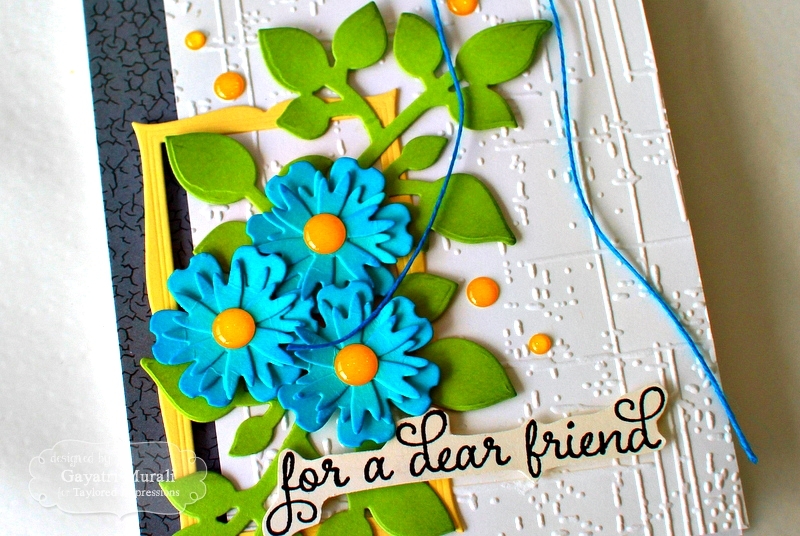 My card base is white with the larger panel embossed with weathered embossing folder. The grey thinner strip is pattern paper from Halloween 6×6 paper pad from Taylored Expressions. The yellow frame is die cut using one of the dies from Frame in Frame die set. The leaves are die cut using Granny Smith cardstock and Leafy Branch die from Taylored Expressions. I sponged some Mowed Lawn distress ink to the edges. 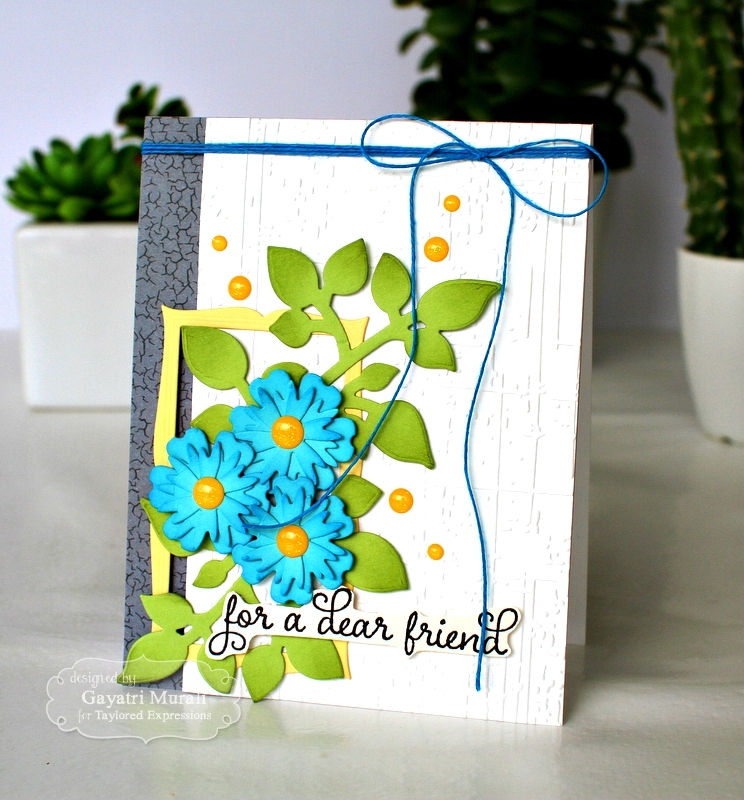 The flowers are die cut using Cookie Monster cardstock using Bloomers 1 die set. I sponged Mermaid Lagoon distress ink to add depth and shading. The flower centres are Doodlebug Sprinkles enamel dots. The sentiment is from Shade Tree Sentiments stamp set. To balance the colours, I added a blue twine with a bow on the top of the card. Here are more details on the challenge. Create a new card or project using either or both components of the challenge posted below. Use of Taylored Expressions products is optional. Add a direct link to your project using the InLinkz below by noon PST on September 9, 2015. Send or give your card to a friend, loved one, or someone who could use some joy! Leave a comment on this post telling us who you sent your card to and why. I have listed all the products I have used to make my card, below. Come and play along Share Joy challenge. LOVE your take on the challenge! Love you layout! I hope to finish mine today. This is so pretty! Love how you used the color combo!! !